Lie on two or three staggered blankets, checking that your body is totally comfortable. Support your head with a blanket, and support your thighs with blocks or pillows. Breathe evenly and relax into the pose. Enjoy for 3 or more minutes, and then roll to your right side. Find more in depth instructions for Reclining Bound Angle Pose here. Lie on your back with some blankets and blocks near by. Hug your knees into your chest, let your back muscles relax, and then then roll to your right side. 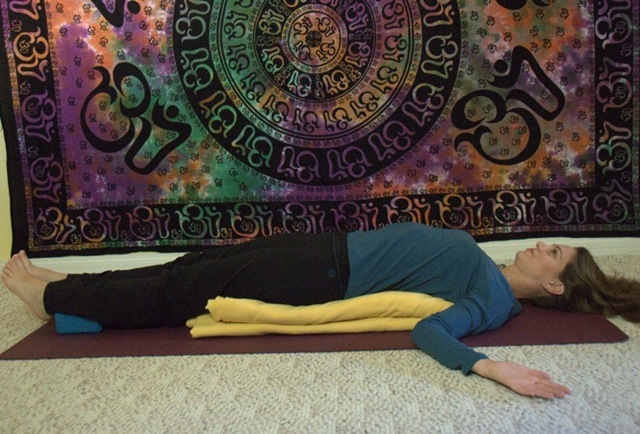 Shift the upper back to the floor, and rest your left arm on the floor or a blanket. For a more relaxing stretch, place a block or two in between your knees. Rest here for 2 or 3 minutes, or until you feel finished with the stretch, and then switch sides. Notice your breathing, and feel the nourishment in your breath massaging your abdominal organs. Find more in depth instructions for Double Leg Reclining Twist Pose here. Lie on your back with some blankets and blocks near by. Roll to your right side, with your left knee bent, and your right leg straight. Rest your Left knee on a block or two, (or more as needed) so that the pose is now adjusted to the comfort level of your body. Shift the upper back to the floor, (or as close to the floor as you can) staying in your own comfort range. Rest your left arm on the floor, or a pile of blankets. Stay here for as long as you are comfortable, and then switch sides. Find more in depth instructions for Reclining Twist Pose here. Bring one or two folded blankets to the wall as shown in picture. Sit on the edge of the blankets with one hip touching the wall, and then swivel around until your sit bones are touching with wall (or as close as you can get ) and then carefully lie down. Place your legs against the wall so they are resting. Make sure your shoulder blades are flat on the floor, so there is no strain on your neck. Stay here for 3 or more minutes, as long as you are comfortable. Notice the deep relaxation that happens naturally with restorative yoga poses, enjoy that deep rest, and nourishment. For more in depth instructions for Inverted Lake Pose click here. Stack 2 or 3 folded blankets and place them a few feet away from a pile of blocks. Sit on the blankets, and lie down on your back so that your lower back is on the blankets, and your head neck and shoulders are resting on the floor. Place your heels on the blocks. For a more restful version of the pose, you can also set yourself up to have the soles of your feet resting into a wall. Stay here for 3 or more minutes, or as long as you are comfortable. For more in depth instruction for Supported Bridge Pose, click here. Stack 3 or more folded blankets and place them in front of you. Sit on your heels, and place your knees about shoulder width apart. Bring the blankets close to your body, in between your thighs. Keeping your sit bones down on your heels, (or close to the heels) bend forward from the waist, and bring your abdomen and chest onto the pile of blankets. Stay here for 3 or more minutes, enjoying the deep peace, rest and contentment. Let your body sink deeply into the pose, especially on your exhalations. For more in depth instructions, as well as a few helpful modifications for Forward Hero Pose, click here. Benefits of the Healing Poses for the Abdominal Organs Sequence: Each of these poses has one of three effects to healing and increased function of the abdominal organs. Twisting will squeeze, tone, and detoxify the organs. Gentle back bending will stretch and lengthen the organs, increasing blood flow to the organs of the abdomen. Supported forward bending will massage and nourish the abdominal muscles and organs. Restorative yoga poses are also very relaxing and often induce the well known ‘relaxation response’. This allows the body to rest more deeply and may speed healing and improve overall organ function. Restorative yoga poses are also deeply meditative, encouraging clarity of mind, inner peace, acceptance and a feeling of overall well being. For a more in depth guide to Yoga, and how it can be integrated into your lifestyle, check out the yoga E-Books here. written and modeled by Christine Wushke, Photo’s by Dianne Wushke.